A: There are 3 ways for a quote, 1. Give us a Call - 1300 924 443. 2. Register online and complete a quote yourself. 3. 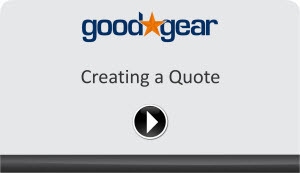 Email sales@goodgear.com.au and request a quote from our helpful sales consultants. View a short tutorial here. Q: Can I get brochures or catalogues mailed to me? A: Yes, brochures and catalogues are available and we are happy to mail some out to you. Remember there are alot of products so let us know what sort of promotional product or uniform idea you are after and we can mail out the best catalogues to suit your needs.We also suggest registering on our website as we have over 15,000 products just on there alone! Use our easy search feature to narrow down what you are after such as typing in "polo" for a range of polo shirts. Click here to register for pricing. Q: We would like to order some promotional items or uniforms, what artwork is required from us? A: For printed promotional products we require print ready artwork which is .AI or .EPS Illustrator artwork or an editble PDF created from Illustrator. For embroidery a hi res jpeg is sufficient. Q: What happens if I do not have my logo in the required format? A: We have an in-house – graphics department, so for a small fee we can re create your logo in vector format as needed. Q: Do all products have to be branded (printed)? A: No, we can supply either blank or have them branded for you. A: Yes, samples are available, just ask. We have some samples in our showroom but since our range is so massive we cant keep them all down there, so chances are we might have it on hand, otherwise we can order one in for you. Q: Are there minimums on products? A: Yes, all products have minimum order quantities. The minimum order depends on the product you choose. For example, screenprinting requires a minimum of 20 units. Embroidery is a minimum of 10 units. Q: What if I have an unusual or unique request? A: Not a problem! We are extremely good at sourcing innovative and different products. Our suppliers are globally based. Chances are if we cant find it locally we can look offshore for you or even custom make an item if the quantity is there. Q: If I don’t know what to use as a promotional product, can I get help? A: Yes, Call or email us right away, we have many years of experience and can help you put together a campaign using effective promotional products. A: Lead time depending on where you are in the country, usually between 10-21 working days from artwork approval, depending on freight requirements we can do it in less time than that. A: All off shore production usually requires 12 weeks. However on large numbers there is a considerable cost saving worth the extra lead-time. Q: How long does it take to produce product with our logo? A: Most products take between 2 to 3 weeks from artwork approval. Q: We have an urgent deadline and need promotional products within 7-10 days, What can you do? A: Yes, we can supply an express service on some of our range. Please give us a call, we will try and accommodate tight deadlines where possible. Click here for a 3 day or less turn around product list.